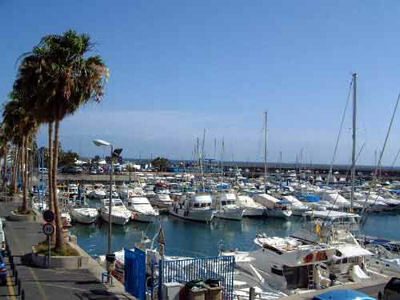 Puerto Colon is located between Las Americas and Costa Adeje in Tenerife. It is a very up-market area with excellent facilities. There is an extensive promenade, allowing visitors to walk all the way along the sea front from Costa Adeje, through to Los Cristianos, passing as they go the wonderful array of restaurants, bars and boutiques, as well as the wonderful sea view. However, Puerto Colon is most famous for the busy international marina, which has the capacity for 360 vessels and 237 dry docks. It is the centre for diving, boat excursions, power boats, yachts, catamarans and fishing charter boats. The nearest beach is Playa La Pinta, which is a small, sheltered beach which is ideal for families with younger children. There is a floating, activity play area suitable for older children, which is great fun. The beach is golden sand and there are sun loungers and umbrellas for hire. There is also disabled access. Complexes in the area include Santa Maria, Club Atlantis and Los Geranios.